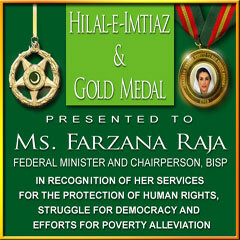 Farzana Raja has dedicated her life towards humanity. She is the advocate of large-scale, technology-based and institutionalized social interventions at private and public sectors. Because the challenges of rising inflation, mounting unemployment, bad governance, corruption, geo-political conflicts and universally emerging terrorist threats at the face of the earth, diminishing the opportunities for the major sections of society resulting in a large segment of population living below the line of poverty and increased sufferings. World has moved beyond global village towards universal families, now is the moment to be united and develop harmony on one-point agenda which is “Humanity”, to mitigate the sufferings of humans. It is mission possible. 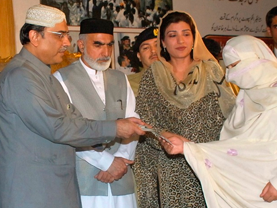 Benazir Income Support Program is a model for other countries. It has been oriented along the lines of my vision of helping the world’s most vulnerable people. BISP is based on Millennium Development Goals (MDGs), the globally agreed set of social and economic targets that are supposed to be realized by 2015. The world community recognizes and appreciates the usefulness of the Benazir Income Support Program and the way it is being managed. US wanted to help Pakistan grew as an economically and socially strong nation for which it will do all that was needed. 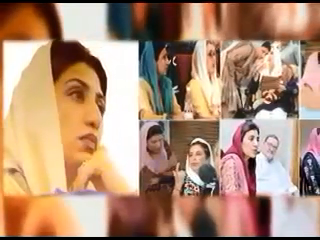 Special attention would be given to women empowerment in the Pakistani society for the welfare of Pakistani women. Benazir Income Support Programme is an important mechanism to protect the poor and vulnerable from income shocks to help them build human capital and establish income generating opportunities. We highly appreciate the commitment of the Government of Pakistan to use innovative mechanisms and modern technology to deliver targeted social assistance to the poor and test multi-pronged graduation strategies for their long-term wellbeing. 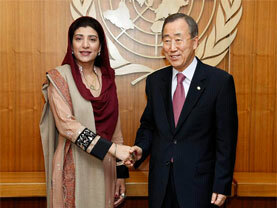 The World Bank, as one of the development partners of Pakistan, will continue to assist Benazir Income Support Programme through its evolution to an objective, transparent, and efficient safety net system that can help Pakistan achieve the Millennium Development Goals, as well as the poverty alleviation agenda in the country. I fully support BISP's continuing efforts to develop as a strong institution with adequate oversight. Every child is precious, every young boy and girl is special, and every young person is unique and has a unique talent to offer to their community and to their country. And, therefore, BISP’s education initiative is a great ambition that in a short period of time every young child will have the chance of primary education and that Pakistan meets the Millennium Development Goal that every child is in school by the end of 2015. It is an aim and an objective and a goal that the whole international community wishes to support. The international community, the UN organizations, the World Bank, the international development departments of many countries want to work in supporting BISP in its determination to tackle family poverty and to ensure that every child can go to school. We will do everything in our power to assist the government in its clear determination to meet the Millennium Development Goal objective." We welcome the announcement of an income generation programs for poor and vulnerable households as well as the ongoing work to launch a health insurance program for the poor. We will be pleased to assist the Government in designing and piloting these new programs so they can be scaled up effectively. My best wishes for the successful implementation of BISP and other safety net initiatives.